A few years ago I learned from Chie that delicata skins are edible. And any skin that’s edible is a friend of mine. It’s less work and delivers more nutrients. Double bingo. If you haven’t guessed already, I’m a home cook but not a chef; in love with fresh produce but usually one to plod through, cooking wonderful ingredients in the same old ways. Sometimes my meals turn into something tasty, other times I overcook the frittata or try to wing it and end up with an unadventurous, under-seasoned soup. So when Chie showed up at our weekly preschool group with a glass casserole dish filled with roasted delicata half-moons, skins on and dusted with cinnamon, I thought I’d faint from the sheer simplicity and deliciousness of it. And to watch the kids devour the stuff! From then on, whenever a delicata ended up in the house, into the oven it went with very little ado. Now I’m not easily bored. But my family? Fast-forward two years; they won’t eat the cinnamon version anymore. It’s time for something new. But the word “new” isn’t in our family food lexicon at the moment. After years of having two rather adventurous eaters, my oldest is settling into a world where only certain foods are acknowledged. Chocolate banana shakes work for her. So do satsumas and cheesy polenta. I can shave carrots and toss them in sherry vinegar. She’ll eat that. But if I slice the same carrot, she’ll delicately take one or two with her required bit of green salad and “no-thank-you” a second helping. Last night she made gagging noises (oh!) and started to cry (please!) when she smelled the (dusting!) of pecorino romano on our frittata. It’s my turn to heave a dramatic sigh. So maybe she’s not quite ready for these beautiful boats, brimming with seasonal veggies, sage and (egads) pecorino. But my youngest? He said, “Thank you for making the frittata for me, Mommy. I like it so much I want some more.” Stuffed delicata for you, my son. Good thing someone other than me may appreciate these stuffed squashes. Because they are wonderful. 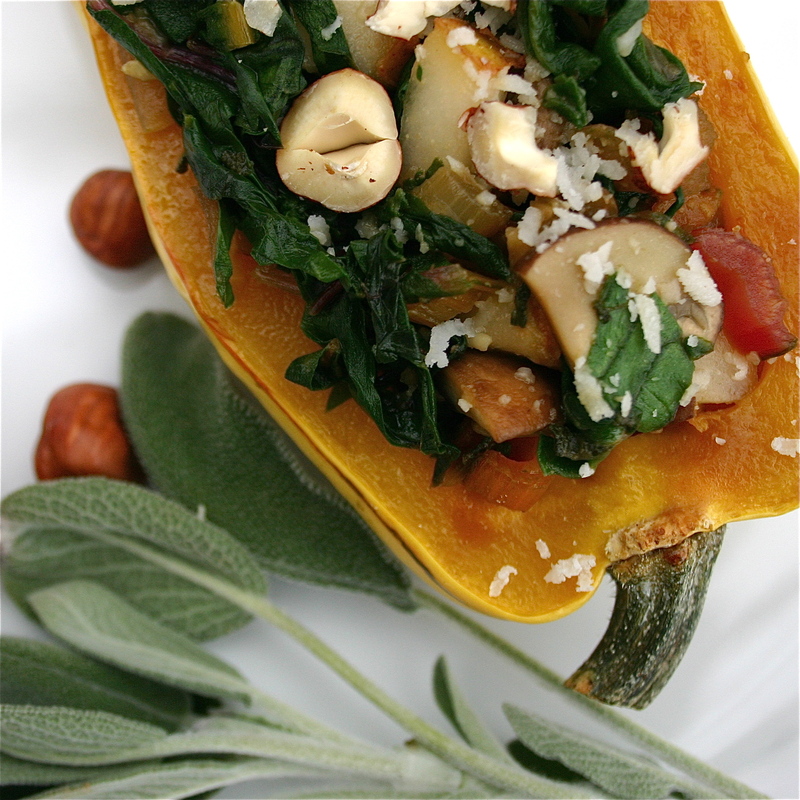 The squash is caramelly sweet, the hearty filling packed with nutrients and texture. Plus, we are backed up on squashes, even still. In October we received this beautiful storage box, in addition to our weekly box full of goodies that now seem so whimsical: iceberg lettuce, cucumbers, peppers. Since then, we’ve only managed to eat a few of the delicatas. Which is fine. They’ve been patiently lining the shelf beneath a painting in the kitchen. Now that we’ve come to our last look at winter squashes, it’s a good time to slice some of the beauties in half and give them a day in the sun, if not on every plate. and Celtic sea salt, but thought it would be fun to have another way to enjoy this autumn treat. roast with a little sea salt, coconut oil, and curry powder. Preheat oven to 350. Cut the delicata in half and seed. down, for 20 minutes or until the flesh is soft. 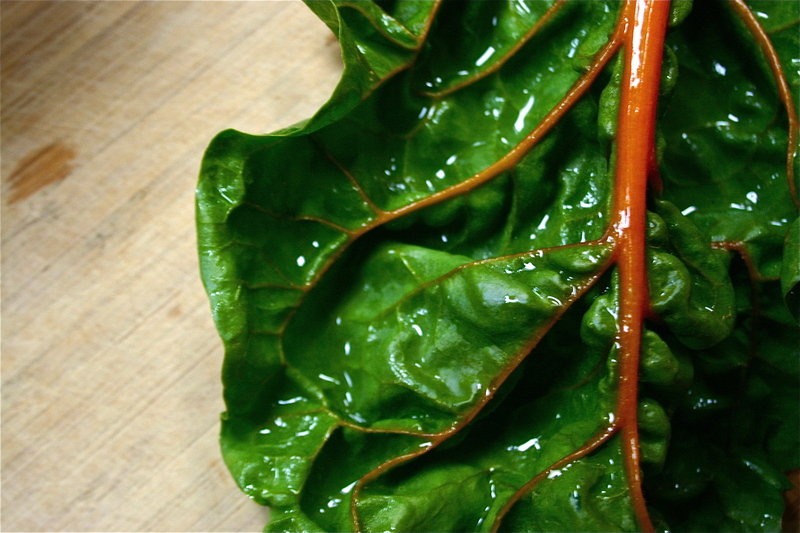 Wash the chard and take the stems out. 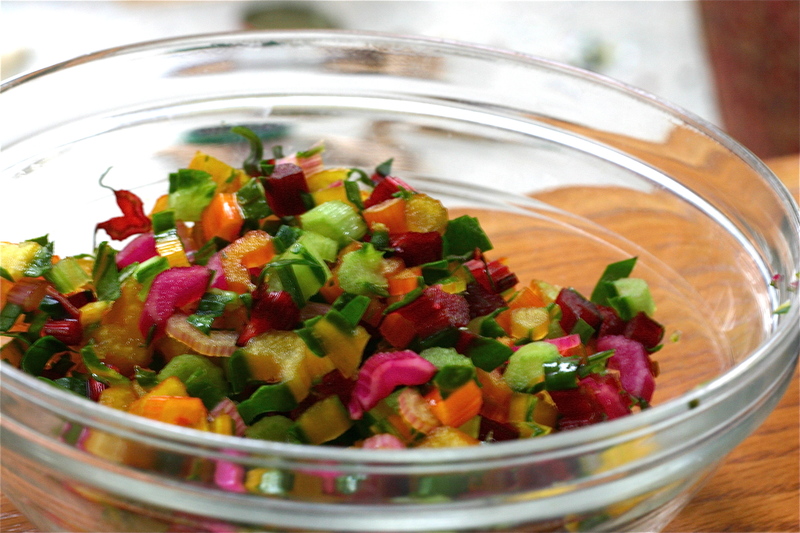 Chop the stems and leaves separately and set aside. 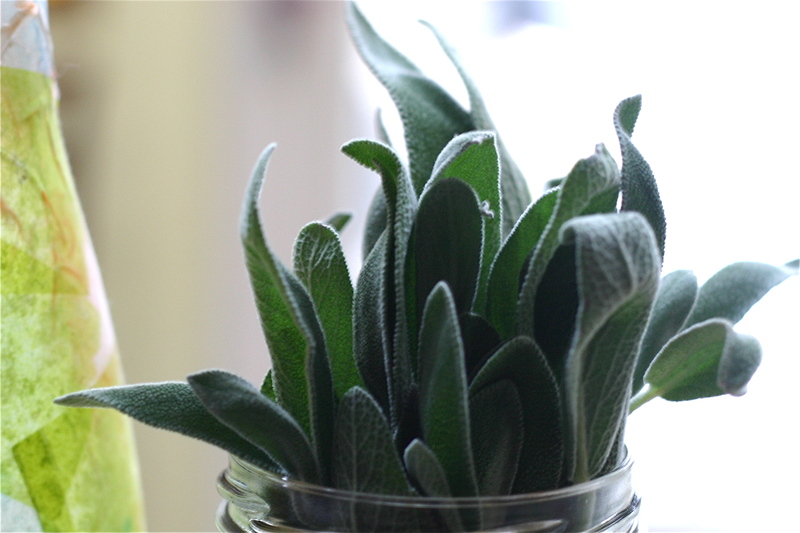 and fragrant. Salt. 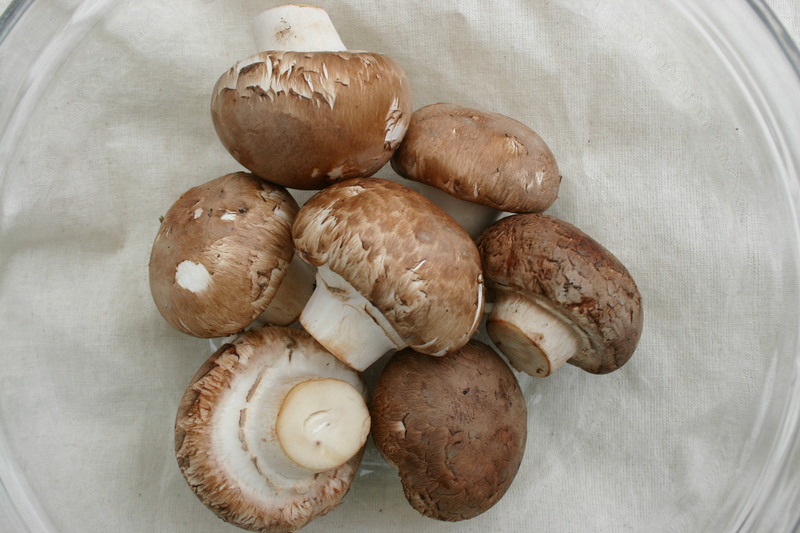 Add the chopped chard stems and crimini mushrooms. Cook until heated. 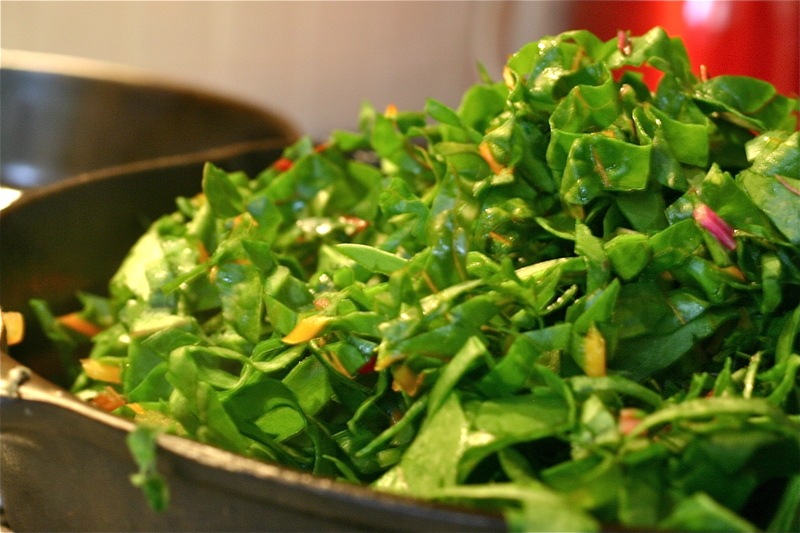 Add the sliced chard leaves, cooking until tender but bright green. Turn off the heat and toss in the diced pear and grated pecorino. 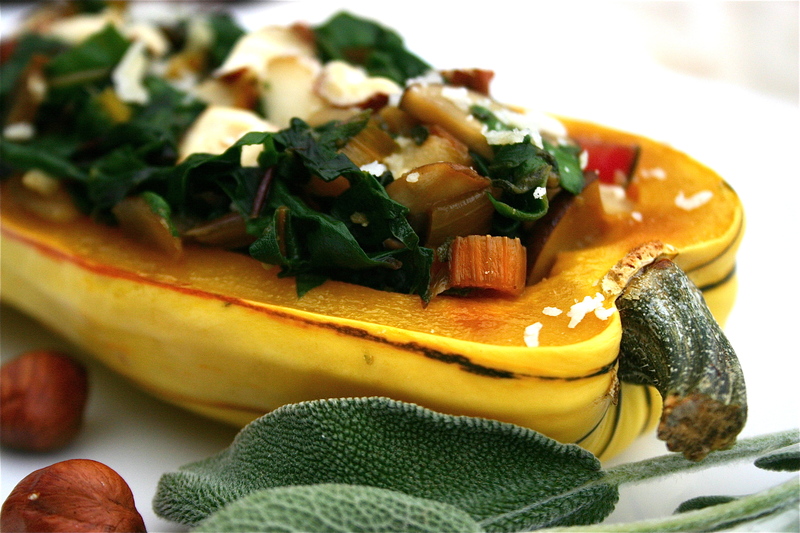 Fill the baked delicata with the chard filling and sprinkle with hazelnuts. 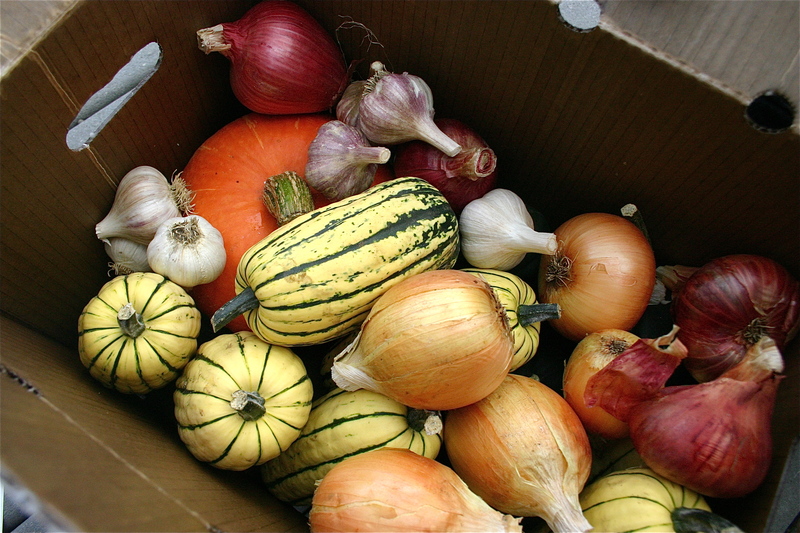 This entry was posted in Fall Vegetables, Recipes and tagged Chard, Garlic, Local, Mushroom, Onion, Organic, Pear, Sage, Squash. Bookmark the permalink. Gorgeous photos of the vegetables, and this squash really does look divine. 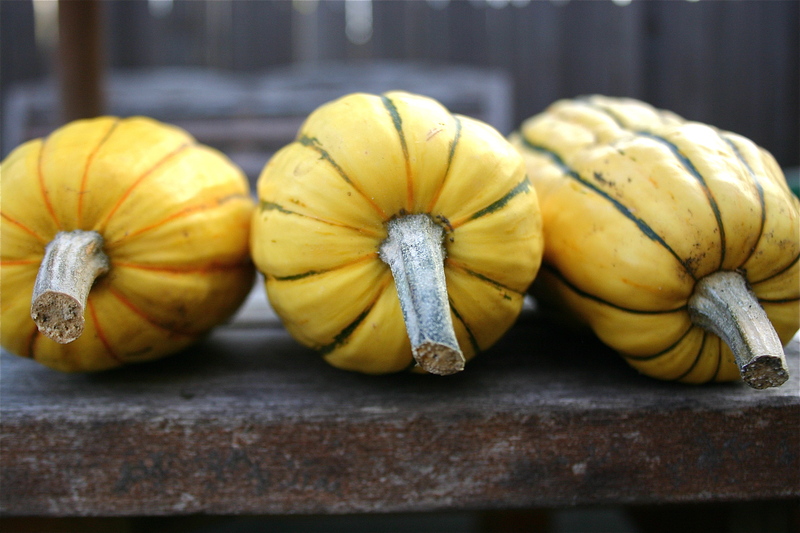 I’ve never cooked with delicata squash, but this recipe has lots of my favorite ingredients in it, so next time I see some or get it in my CSA box, I’m going to try it! Thanks for stopping by my blog and I’m so happy to see yours…I’ll be back! Thanks for visiting! Oh, I hope you do try delicatas. I just discovered them a couple of years ago and they’re now one of my favorites. Looking forward to keeping up with your blog as well!